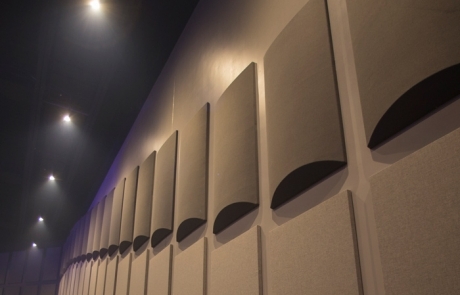 Barrel Diffusers bring form and function to recording studios, music venues, houses of worship, and other spaces requiring sound diffusion. Both aesthetically pleasing and high-impact ready, they evenly diffuse sound in your room while effectively eliminating flutter echo. 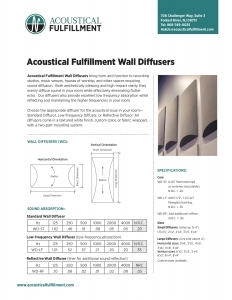 Our wall diffusers provide excellent low frequency absorption while reflecting and maintaining the higher frequencies in your room. Choose the appropriate diffuser for the acoustical issue in your room— Standard Diffuser, Low Frequency Diffuser, or Reflective Diffuser. All diffusers come in a textured white finish, custom color, or fabric wrapped. Wall diffusers include a two-part mounting system. Ceiling diffusers are made to lay in grid or direct mount.